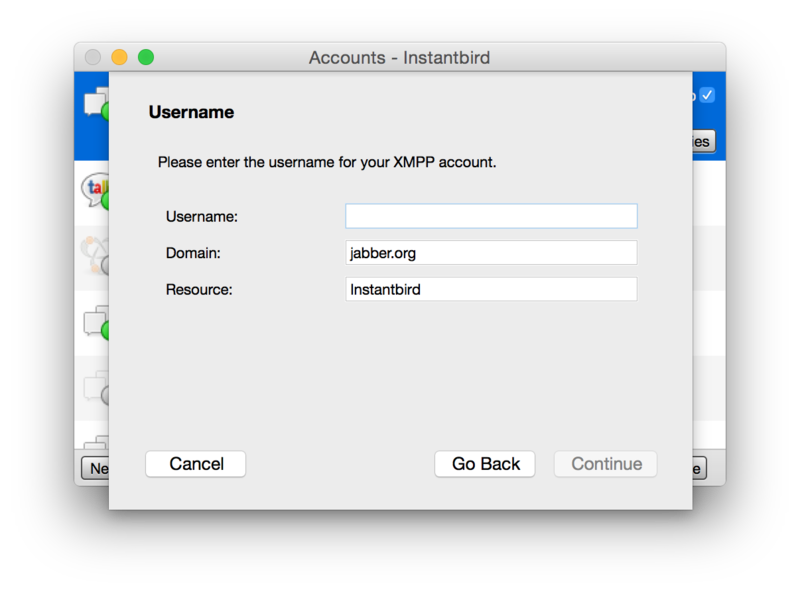 Create an XMPP account and enter any username without the "@" character. Complete the account creation process. Instantbird will give an error for that account saying: "Invalid username (your username should contain an '@' character)." This issue has been reported by many Tor Messenger users. Perhaps we can indicate on the username page itself that a username (JID) is in the form of username@server, since users take username to be just the username minus domain.tld. Right now, the error is shown after the account creation process is completed. > Please enter the username for your XMPP account. > Please enter the username (user@domain) for your XMPP account. I agree it would be nice if the input was checked for validity immediately. When we use the libpurple prpl for XMPP, the username is split between the username, the domain and the resource (http://i.imgur.com/0kYFwmW.png). Was there a conscious decision to not do this for JS-XMPP, or was it just never implemented? > > Please enter the username for your XMPP account. > > Please enter the username (user@domain) for your XMPP account. - Should we redesign the JS-XMPP UI to match that of libpurple? - Else, we can just use usernameEmptyText and set it to "username@domain.tld" or "username@domain.com" so that users know that they have to put in the JID and not just the handle. - If yes, should we validate immediately and not wait till the account completion process has completed? Or is setting the usernameEmptyText hint enough? The libpurple UI had its own variant of this bug, bug 953873. > - Should we redesign the JS-XMPP UI to match that of libpurple? That doesn't require touching the UI code either, user name splits are already supported, you just need to declare them. See http://mxr.mozilla.org/comm-central/source/chat/protocols/irc/irc.js?rev=f28ff368b740#1915 for an example. We already do some form of validation to avoid creating duplicate accounts. Checking that the username actually has a reasonable syntax would be a good addition. > username, the domain and the resource (http://i.imgur.com/0kYFwmW.png). > We already do some form of validation to avoid creating duplicate accounts. I don't think that ever landed: bug 954943. It'd be nice if a prpl could validate account information before being created, yes. But then we're conflating two issues. I'd suggest splitting that into a separate bug if it is desired. > > username, the domain and the resource (http://i.imgur.com/0kYFwmW.png). As the bug I linked to earlier suggests, it's likely still necessary to provide a good hint or tooltip. So for now then, should I then focus on something that serves as a hint/tooltip using usernameEmptyText? The validation will then be another patch. - splitting the username is something that should be implemented. It's easy to do. - validating the username syntax would be nice, but should be a separate bug. This implement the username split. Note that we don't include the resource (like libpurple does) since it is a protocol option in JS-XMPP. This was a choice we made on purpose, I believe. Thanks! I'll check this in soon. If we want some sort of validation in the form, we need to file a new bug. > If we want some sort of validation in the form, we need to file a new bug. This now also means bug 953873 needs fixing.